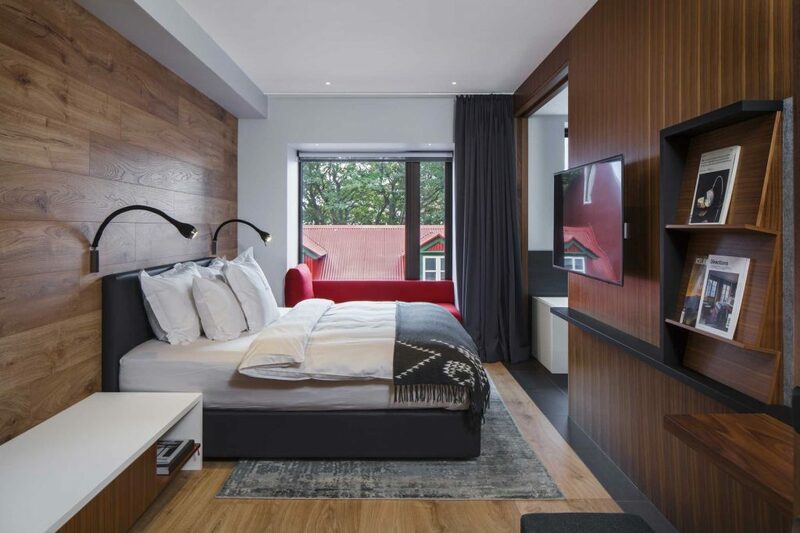 This week’s instalment of the #SBIDinspire interior design series features a boutique hotel which juxtaposes the austere beauty and fiery drama of Iceland’s natural wonders with the City Center district by using natural materials in their most organic form and monochromatic colour schemes that mirror Icelandic nature and culture. 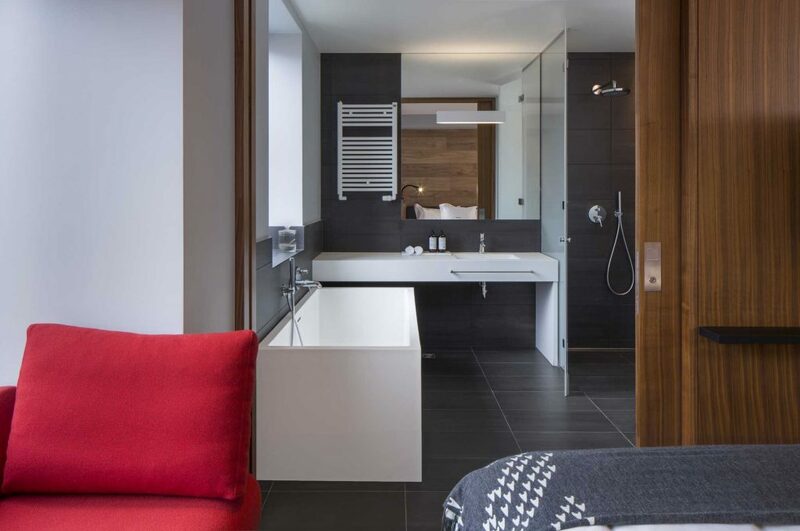 Sustainable materials native to Iceland provide the perfect touch for this unique and eco-conscious hotel. 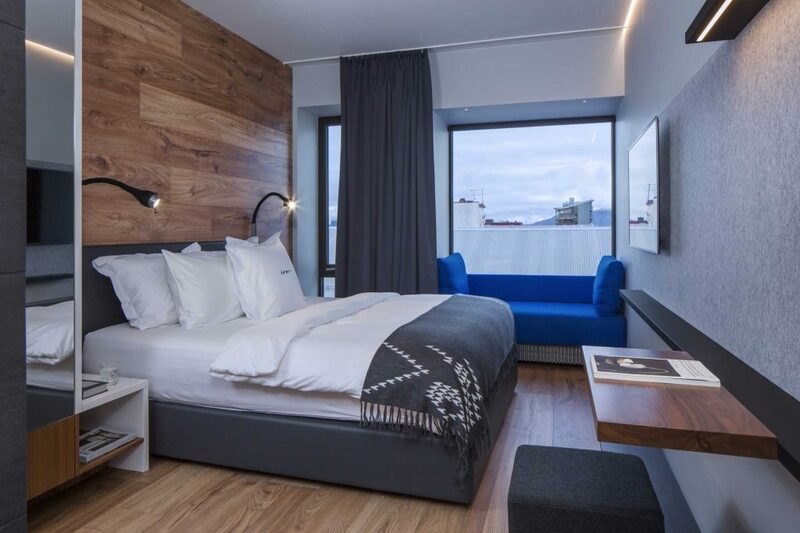 Conveniently located in the heart of Reykjavík, Iceland, the hotel was originally a hostel for Reykjavík backpackers which was renovated to offer a sustainable and tranquil refuge to its guests. Inside one instantly feels transported to the pristine countryside of this otherworldly isle of fire and ice. 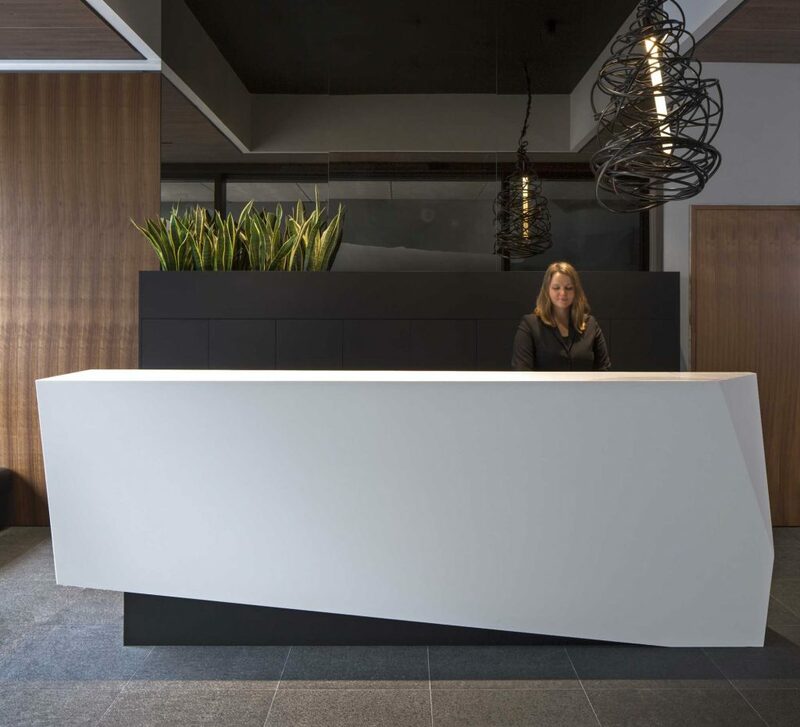 In the lobby sits a glacier-like front desk and infinity hallways connecting guest quarters mimic hot lava floes zigzagging across a vast blackened field. Each private bath even features geothermal hot water, sourced from the surrounding natural springs. Design elements are also oriented to take maximal advantage of natural light and ventilation. 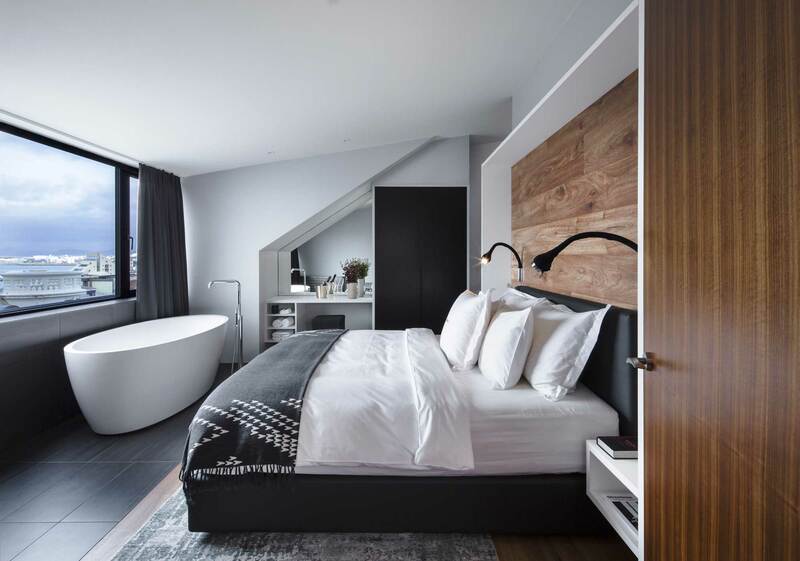 A profusion of natural light streams through the expansive guestroom windows with sweeping views of the North Atlantic sea and snow-capped mountains to the North. Sustainable heating was introduced and LED lighting is utilised throughout to decrease electricity usage by up to 75%, with hallways using motion detection. Not only does the guest feel a sense of magic when the lights turn on, but the hotel saves energy when there are no guests in the hallways! To design a functional, urban, aesthetically pleasing space that would accommodate all amenities necessary for a great experience for future guests. Icelandic nature was the main influence to the interior design of the hotel. 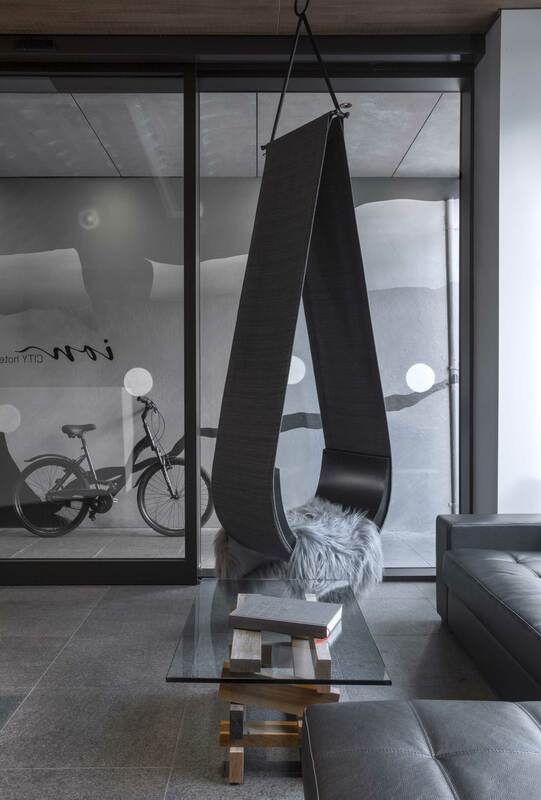 The concept story of the hotel design was to bring the nature inside, in the form of materials and colour schemes to experience and get the sense of the austere Icelandic nature, without getting out of the city. We wanted to create an experience for the guests that will live in their memory. 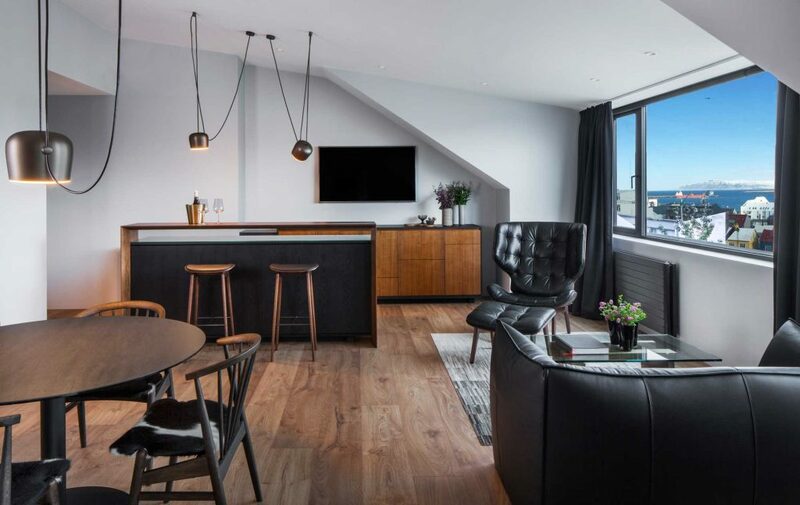 The challenges to work with the existing building, local regulations along with the essential amenities needed to accommodate a happy stay for the hotel guests. The hallways were a challenge as they were short and small so we wanted to utilise them to their full potential. 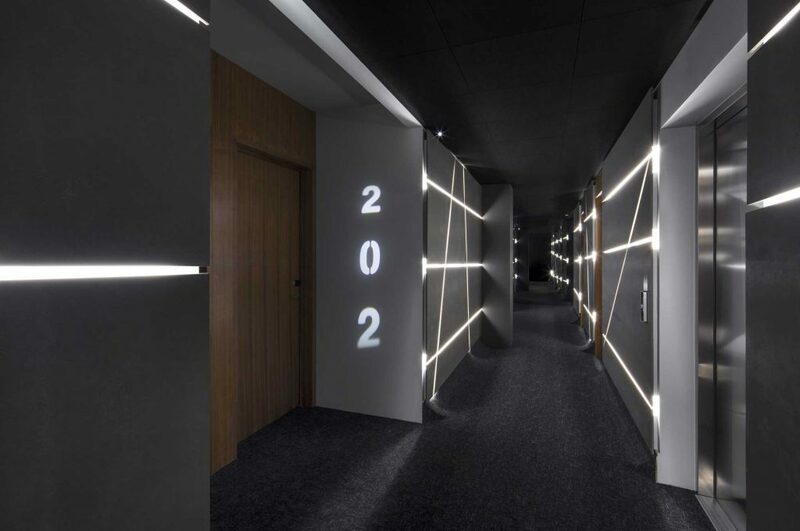 The design is inspired by the countryside’s rugged terrain, with cuts of light illuminating to the guest rooms and mirrors on each end of the short hallway, they play with perspective creating a memorable experience like walking through infinitive lava fields. 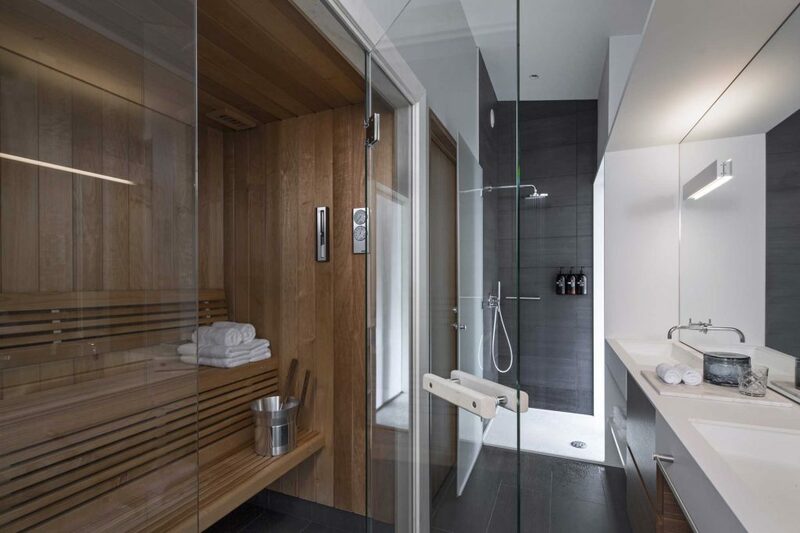 There are many items and elements of the interior design we are especially proud of and have personal meaning to us, including the bathroom works on the walls, which are custom handmade by Erla. The illuminating hallway connecting the guestrooms imitate the flowing lava fields; the white Corian lobby desk inspired by the surrounding glaciers; the Dropi chair in the lobby that suspends from the ceiling in the intentional shape of a raindrop; the Nest chandelier hanging above diffusing light through it’s intertwined form along, with the overall cohesion and outcome of the design as a whole. 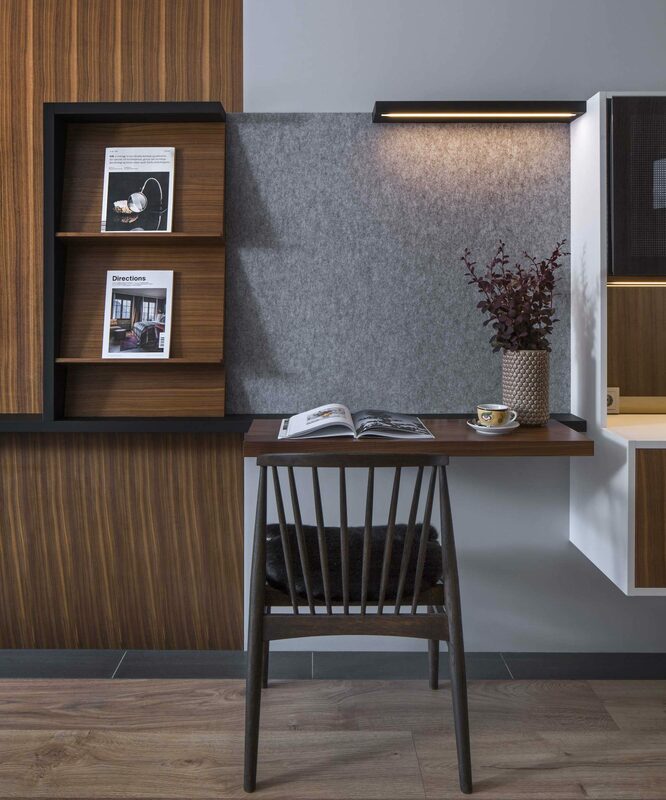 The SBID International Design Awards is one of the most prestigious awards celebrating interior design and architecture today, we consider it an achievement to receive an SBID International Design Award and we would be honoured to win one for our designs. We have previously won for a house we designed in Iceland, Big Little Rock and nominated for our Ion Adventure Hotel. If you missed last week’s Project of the Week featuring an American neoclassical design concept with comfort and function, click here to see more.